To answer these questions, Raynor shares compelling stories from an eclectic group of 40+ Christian entrepreneurs, including the founders of TOMS Shoes, Charity: Water, Chick-fil-A, In-N-Out Burger, Guinness, HTC, and Sevenly, as well as nontraditional entrepreneurs such as C. S. Lewis, Johann Sebastian Bach, and J. R. R. Tolkien. Raynor's "show" rather than "tell," story-driven style makes you feel as if you are sitting at the feet of some of the godliest and most successful entrepreneurs of all time. Perfectly poised to reach today's growing creative class, this unique work restores God's position as the first entrepreneur, helping readers see the eternal value in the work they do today. Have you ever read a book where you thought, Man this person is smarter than I am? That is exactly what I think of when I talk to people about "Called to Create." 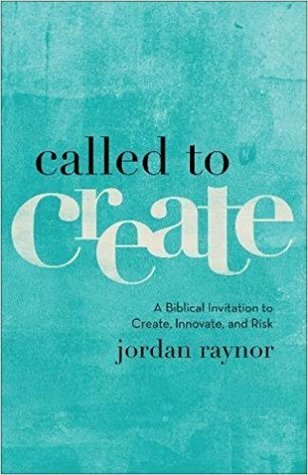 This book doesn't make you feel intimated, but rather it brings you on journey of a Biblical perspective of what it means to cultivate a Biblical foundation of creating and being an innovator in the business world. I love the idea that entrepreneur is anyone who takes risk to create something new for the good of others. We can all classify ourselves as entrepreneurs when we look at the definition this way. Whether you're making a new recipe for the first time or creating a document to share at work, you're doing it for the betterment of others. I love this! I also enjoyed the idea of creating and businesses being about furthering the Kingdom of God! I love that this book was about being Kingdom minded, which is so important and lacking in the business world today. This book is a mix of creating and business all in one. I highly recommend it! The principals and foundation it lays is outstanding. It is a great book for being a Christian, and creative entreprenuner! You will love this book. I give it 4.5/ 5 stars. A favorable review was not required. Thanks for the great review, Sarah! Thrilled you enjoyed the book.